Harsh weather has the ability to hit hard at any given time. You may have a power cut with severe weather. The networks of communication may show a low signal.You cannot be sure or assume that our technology of today will definitely work despite the weather condition. Imagine that your cell phone, TV as well as computer cuts off when a calamity strikes.How would you get aware about an approaching hurricane or tornado? Which place would get you any information on the situation? Also, what means of communication would you use for reporting to the concerned officials? A lot of people could get stranded when it is dark in a harsh weather occurrence. You can ensure that you are not unaware of any information and be ready at either your workplace or home with a weather radio. In order to stay on par with the weather condition in your area, you require a weather radio accompanied by a source of backup power. This is the only trustworthy medium that is available when it comes to obtaining alerts on disaster and weather calamities, keeping you aware of the weather in your area. Radios of the Desktop type happen to be clear as suggested by its name—this type of a radio is powered by plugging to an AC outlet and is placed onto your desk.Weather alerts in your respective location are broadcast once issued, also these alerts are able to repeat like an alarm clock of your bedside. Batteries also can be used as a source for backup power; however, they are not portable in design. Generally, most models are found having a display that highlights an alert level of threat (advisory, watch or warning). Also, the kind of active emergency event is shown (flooding, hurricane, thunderstorm, tornado and so on). Emergency radios are portable. Basically, these radios can run with internal power. They are commonly shockproof and weatherproof. Constructions of the radios are sturdy and you can use rechargeable batteries rather than the use of AC power by plugging in. The ultimate models of emergency radios are able to get charged simply by the use of solar power or hand crank. This feature makes these type of radios excellent for situations wherein you are in complete seclusion from any communication network or even electricity especially during outdoor calamities or when there is planned power cuts for an extended duration of time. There are some emergency radios that possess additional functions, like an inbuilt flashlight as well as light for reading. They also cover the potential of providing your phone with immediate power so that it becomes possible to make a call in an emergency. You actually don’t have to become a type of person who is a survivalist or a kind of a prepper in order to possess this type of a radio. As a good practice of ensuring safety, every household should own an emergency kit to use in case of a crisis. The emergency radio, in my opinion, is an important equipment to help in being ready as well as keeps you informed to secure the lives of your dear ones. Which type of Radio is better to pick, an Emergency Radio or a Desktop Weather type? A nature-loving enthusiast will most likely find the emergency radio to be greatly resourceful since it is possible to use it outdoors (at camping or hiking trips) as well as indoors. My suggestion is keeping the desktop radio just next to your bedside at home so that it is prepared and you get information on any upcoming threats. Also, have the emergency radio packed away and prepared to put it into your emergency/survival supply kit. This kit can be used during incidents when your power cuts off or in case you have to get away quickly from your home. Which type of radio do you choose? There are dozens of recent desktop type of emergency and weather radios that we have studied. Also, we have read authentic reviews of consumers to create the models’ rankings as below. See the highly rated weather radios available. Midland WR400 easily is an excellent weather radio of NOAA. This becomes twice advantageous functioning as an FM/AM alarm clock as well. This feature can replace your existing alarm clock too. It has a big, bright screen that shows time, current alerts and battery life. There are 4 presets used for easy tuning of the device. Being a weather radio that is certified as a Public Alert, you can easily connect with a device that is an external alerting type. However, the most appreciated feature is having customizable alerts possible. For example, if you are living in your respective county well inland, away from the shore, all warnings of the shore hurricanes are irrelevant, so it is possible for the WR400 to filter these out. Maybe you might only wish to receive alerts on warnings rather than watches. For this, you can install WR400 such that it alerts you to specifically issued warnings only. This reduces the number of times your radio turns off due to harsh events of weather. The quality of sound is typically shown as the top-rated features of WR400, accompanied with great reception functioning. This is frequently a concern with the other type of weather radios. It is necessary to have clear signals for the alert system of the SAME to function. There was a review by one customer who remarked that the screen display was very bright in spite of its setting to ‘dim’. One of the best kinds of emergency radio is the Midland ER310 produced by Midland. It comprises of a rechargeable battery of 2600 mAh capacity which can be easily charged by 3 ways, i.e. with a USB, hand crank and solar power. Also, it is possible to power this radio with 6 batteries of ‘AA’ in case of backup requirement. This radio supports FM, AM along with the weather radio NOAA band. It has an inbuilt flashlight of 130-lumen as well as the USB port which allows charging of the smartphone or devices which are USB powered. Regular use with radio time of 32 hours is possible with its internal 2600 mAh battery. The Company states that you can easily charge up even a battery that is dead with sunlight of one hour and that is sufficient for operating the radio for a 45 minute period. Additional beneficial features are the SOS feature of strobe light (that flashes in Morse code ‘S-O-S’) along with a whistle that happens to be a dog ultrasonic type helps to find your dog in case it is lost. 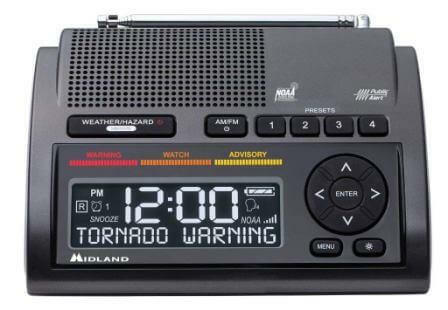 In our opinion, Midland ER310 weather radio is the ultimate one to use in the emergency kit, especially for outdoor adventures. It is trust worthy, sturdy and comprises of all the important features that assist you to survive in case of any calamity. Reviews of customer frequently mention superb sound quality via its speaker and also that it is quite a user-friendly device. An excellent desktop type of weather radio is the WR120EZ which obtains its plus points because it is priced at an affordable price with a set of strong features. Display of Alert messages of the weather on the screen can be seen in 3 languages – French, English, and Spanish. Its siren is 90 dB loud with warnings of flashing LED to make you aware if an alert is a warning, watch or an advisory. Although it is cheap, it has a certification of Public Alert; this filters out the unwanted alerts as well as provides the facility to attach devices for an external warning to it. Audio quality and reception is superb, even though not as powerful and clear as the WR400. In case there is a power cut then 3 batteries of ‘AA’ type provide power for a backup source. Scanning of other channels is possible so it never gives you a chance to miss out on any alerts. For the price, the features of this device are impressive. Although there are a few negatives points that are expected since it is positioned at an introductory level. It isn’t as sturdy as the WR400, also its screen is not too informative. Also, the display of the radio faces upward instead of outward (WR400 displays outward). Reading of alert messages physically will require you to walk to the radio. 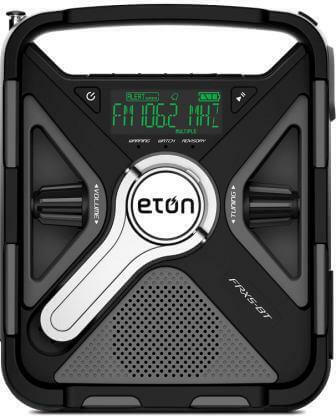 In functionality, there is a similarity between the Eton FRX5BT and Midland ER310. The FRX5BT is charged by its micro-USB cable, solar or with a hand crank. It has a rechargeable 2000 mAh battery that provides you with sufficient capacity for charging another device. It is the ultimate emergency radio of the hand crank type. It is easy to move and to charge it. We’re fascinated by its Bluetooth functionality that lets you connect your device and smartphone so it can be used as a speaker for various entertainment benefits. Although, it has the ability to receive SAME alerts, its display like the other type of radios featured above doesn’t display the alert type. This device also includes a beacon of red emergency and LED flashlight. There is one separate light that is the dimmable type. Its casing is rugged that is excellent, providing the FRX5BT a great deal of sturdiness. As a matter of fact, this radio is drop-proof with a limit of 3.3 ft height as well as it is water-resistant up to the specifications of IPX4. However, an area that Eton doesn’t stand out tall like our other top ones is the reception. There are some reviews that mention problems with the receipt of weather alerts in an area that is rural. It has a decent sound quality with the availability of adequate signal. Also, its battery is internal and rechargeable but is smaller compared to a few other radios. 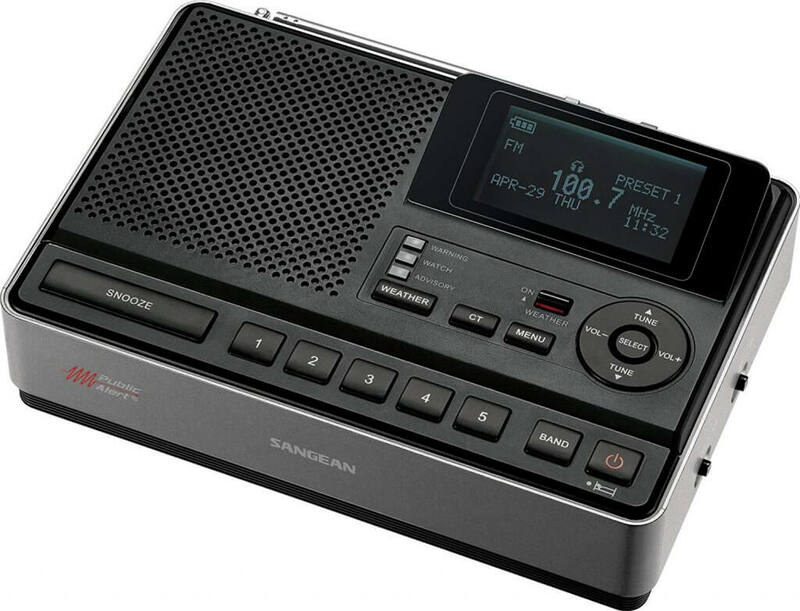 Sangean CL-100 is renowned for developing shortwave radios of good quality. Their weather clock or FM-RBDS or AM radio “CL-100” is an example of their quality. This desktop radio is a one of its kind that operates FM-RBDS (text messages which shows up on the car radio indicating the song currently playing or informing about the station). It also comes with an audio jack so that an external source of audio can be connected. In the SAME-capable CL-100, the alert messages pop up on the display which is upward facing. The quality of the audio is excellent due to the digital processing of signals. It also enables you to save up to five channels for FM as well as AM bands. The clock radio is convenient and includes a Wake-Up System. Basically, music and alarm sound settings can be adjusted to get louder gradually, to wake you gently as against the conventional alarm which is harsh to the ears. The only concern that we have is the display and the unsatisfactorily written directions. The display is a bit unusual as you have to be above the radio to see the display. There were also some reports from users regarding the RBDS signals not being received correctly. Electrical power is one of the first utilities to go in the event of an emergency. To overcome this situation, a dependable device that uses its own power will be needed to help you against any upcoming hazardous weather and enable you to stay connected with the world. 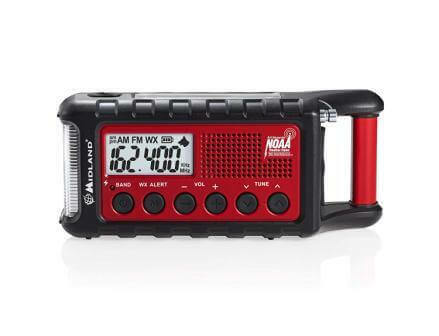 The finest radios for an emergency have a rechargeable battery of at least 2000 mAh, have an excellent reception to NOAA channels of weather and comprise various options for charging the radio unit. Our topmost recommendations include the Midland type WR400 which is a desktop type of radio and Midland type ER310 which is an emergency radio variant. 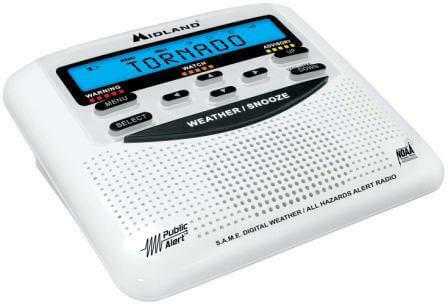 Midland has been among the foremost companies to develop weather radios. It has deservedly gained prominence as a market leader due to developing good quality radios that are dependable in the event of an emergency. A lot of options are available for choosing the best weather radio. However, there are some which are not very accurate as the others. A few models even don’t comprise of the vital features that are needed. Nevertheless, below listed are the features that in our opinion you should to consider while purchasing the ultimate weather radio. There are all kinds available but the one you choose should to hold a logo stating ‘Public Alert’ or ‘NOAA NWR – All Hazards’ (a few hold both these logos – which is great). Certification of the weather radios is done by these mentioned standards which are a third-party type. Both the programs have been advanced together with the Service of National Weather and NOAA. Radios for Public Alert precisely meet a stringent technical limit. These kinds of radios should to have the capacity of receiving location-specific alerts. These also must be capable of switching off the irrelevant ones (such as warnings of a coastal flood to those who are in the interiors). It is mandatory for them to play one tone prior to the broadcasting of an alert. Also, for the powering of devices used for notification like the strobe light, it is necessary to have one external jack. The below listed are the 7 frequencies via which the Service of the National Weather broadcast and the weather radios are able to get tuned to. However, standard radios cannot access these stations. SAME is supported by the excellent models of weather radio (NOAA). SAME is the abbreviation of Specific Area Message Encoding. With this feature, the device is able to ignore all the alerts of weather that are not of your respective area/location. Generally, most people are interested to hear about alerts which are specific to their respective location or state. Nevertheless, this feature reduces the possibility of ‘false alarms’ from events in places which are located at a distance from your location. Your common desktop type weather radio regularly is accompanied by a power cord (AC type). Although, these type of radios have batteries additionally in form of a backup. This allows them to run for a brief time period upon a power cut. However, this could work for a lot of people yet isn’t practical for emergency situations such as power cuts for an extended period of days or weeks. People who require higher portability and need a radio without changing batteries or devoid of AC power may get their service as required from the emergency radio type. Since these type of devices possess a battery that is internal and rechargeable. The batteries simply require sunlight or hand crank turning to provide sufficient power to work (most batteries can be instantly charged with a USB prior to facing weather that is potentially hazardous). Anyway, you need to check out the weather radio which has an indicator for battery life. This will get you notified prior to the running out of the device. Also, ensure that you favor the radio which possesses a battery that is rechargeable having the least capacity of 2000 mAh. This allows it to remain functional for lengthy periods of time. See that your respective weather radio has an alert that is loud and audible. In case you have difficulties in hearing, obtain a radio with certification of Public Alert. These type of radios possess an external jack which can attach to a warning device that is external, such as the strobe light and so on. One of the most important qualities needed in emergency radios is their durability. In the event of an emergency the device is expected to be thrown around and hence you will need a well-built device having a shockproof cover. In addition, a waterproof cover will also be advantageous to protect it against wet weather. You will also need some durability for the desktop radios as these radios are supposed to be long-lasting. Hence it is essential to purchase a radio with a solid construction and avoid cheaply made products. You will have to decide for yourself the weight and size considerations while selecting an emergency or desktop radio. Ideally, the portable and small weather radios are easier to move around and are hence suitable in emergency kits. However, they tend to be fragile and their sound is not very loud. The bigger radios have a louder sound and are long lasting, but it is difficult to move around with them. Get a ‘2 in 1′ benefit in your kit for an emergency. See if you could obtain a radio having a reading lamp and integrated flashlight. These features can be used in case of a power cut. Having a flashlight which is integrated is typical feature of many emergency radio types. The desktop type of weather radios do not possess this feature, you need to take note of this while deciding to buy one. Nowadays excellent emergency radios are accompanied with a USB port which offers instant charging of your smartphone. However, I would want to warn you not expect that your smartphone will get fully charged, instead, it would be sufficient charge for dialing at least an emergency call.